Read some of the stories . . .
Forty writers from North Carolina and Kentucky share their personal stories of making do and overcoming adversity under challenging circumstances in the spirit of America’s pioneer hero Daniel Boone 250 years ago. He was trapped by an early snow storm in the winter of 1767/1768 and had to survive by his wits and will deep in the hills of eastern Kentucky—bearing up. Through 45 short essays, you are pulled into a range of captivating life experiences by these writers—both fresh, new voices and seasoned storytellers. They skillfully share true stories, imparting morals, messages, and lessons for us all to consider. With drama, tragedy, and sometimes humor, they share their tales and family histories about bearing up when facing some of life’s daunting and peculiar challenges. New book released April 3. Copies available for shipping after April 18. Order now at a discounted price. Go to "Books and DVDs" to order online. This biography of America’s pioneer hero tells his life by putting his story on the landscape. It takes readers to 85 sites spread across 11 states where they can see markers, monuments, plaques, historic homes and replica forts. It shares the episodes and adventures of his life which unfolded there, knitting them together to reveal the full sweep of his amazing life spanning a remarkable 86 years. These are places commemorated by prior generations of Americans where Boone lived, hunted, fought, and dreamed of the next frontier. Step into America’s story. Take the tour of the sites from In the Footsteps of Daniel Boone without leaving home. See all the sites in color and take an 80-minute armchair tour with music and narration. Go to any site in any order you like with this interactive DVD. Over 800 color images bring the sites to you. See markers, monuments, plaques, landscapes, cabins, historic homes, replica forts, and more, including images of reenactors. Leading up to and including the consequential Battle of Kings Mountain, which turned the tide of the American Revolution, this carefully researched book shares six years of Revolutionary War history in the South told from the militia side. Campaign along with these men as they learned to fight “Indian style” on the western frontier, as they confronted their loyalist neighbors and bands of Tory outlaws, and as they responded 1,000-strong to the arrogant threats of British Major Patrick Ferguson. 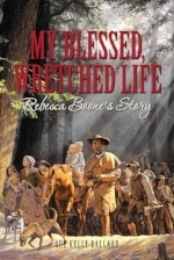 Historical fiction by Kentucky author Sue Kelly Ballard tells the story of Daniel Boone’s family in the care of the person who knew him best—his wife, Rebecca Boone. Built upon historical accounts of time and place, Ballard, a descendant of Daniel and Rebecca, creates realistic dialog and weaves an engaging, enthralling account of the family’s experiences, one of the few treatments we have of the woman’s experience of the pioneer life. Autographed copies. During 1912-1915, the Daughters of the American Revolution in North Carolina, Tennessee, Virginia, and Kentucky erected 50 cast iron tablets spanning across 400 miles to mark Daniel Boone’s Trail from the eastern foothills through the Cumberland Gap and into Kentucky. This is the story of dedicated commemorators who captured a piece of American history just before it would have been lost forever to the ravages of time and development. See the 30 markers which have survived a century and join in discovering what happened to the 20 which have disappeared. Celebrate this great accomplishment of the Daughters of the American Revolution a century ago. Follow the King Mountain story across 330 miles lying in four states along the commemorative motor route honoring the “overmountain” militiamen who crossed the Appalachians and joined with other backcountry militiamen to “turn the tide” of the American Revolution. Visit historic markers, informative wayside exhibits, museums, replica forts, grave sites, and battlefields. Put yourself on the landscape to better appreciate this heroic story which helped garner our Liberty. Stretch your legs along 84 miles of walkable trail. Bear hunter, scout, volunteer soldier, militia leader, state representative, U.S. Congressman, presidential hopeful, author, farmer, entrepreneur, son, husband, father, and martyr to Texas freedom—David Crockett (never “Davy”) led one of the most exciting and colorful lives in American history. This book shares the full story of his remarkable life by taking the reader to 49 sites spread across 10 states and the District of Columbia where the life of this celebrated frontier hero and American icon unfolded. These are 67 stories of some of North Carolina’s more colorful characters as revealed by Dr. H.G Jones, former director of the NC Department of Archives and History. Ann Bonney and Mary Read—a pair of women pirates, the true story of betrayal behind the Ballad of “‘Omi Wise,” the 73-year old NC governor who married a 15-year-old girl, Babe Ruth’s first professional homerun, Annie Oakley at Pinehurst, and aviatrix heroine “Tiny” Broadwick. It’s all here and more. In 1963, the Daniel Boone Wagon Train attracted enthusiastic pioneer “wannabes” to Northwest North Carolina for an exciting frontier experience, a three-day wagon excursion into the Blue Ridge Mountains. The rolling, rollicking party was so much fun, they continued it each June for 11 years. The stories of the annual events unfold against the backdrop of the tumultuous Sixties—Civil Rights Movement, the Beatles, the Space Race, Vietnam, and Watergate. Relive and remember it all. Use the form below to contact the author for inquiries related to speaking engagements, book orders, educational materials in the classroom, or just to say, "hi." Please include information about yourself and your organization.